Brigham Young was the 2nd President of The Church of Jesus Christ of Latter-day Saints, also known as the Mormon Church. He has been referred to by some as a “Modern Moses” because, like the biblical figure, he led his followers on an exodus through the desert to the promised land. Brigham Young was the founder of Salt Lake City and he became the first Governor of the Utah Territory. He was a polygamist and had at least 26 wives and possibly as many as 55. The discrepancy is due to differences in what people define as a wife. He has also been called the father of Mormon polygamy even though his predecessor Joseph Smith was also a polygamist with possibly as many as 30 wives. Brigham Young is the 3rd great-grandfather of legendary Hall of Fame quarterback Steve Young who led the San Francisco 49ers to victory in Super Bowl XXIX. He also has a number of U.S. presidential kin including George Washington, Calvin Coolidge, Millard Fillmore, Franklin Roosevelt, and both Presidents Bush. He also has kinship to fellow Mormon and former Governor of Massachusetts Mitt Romney. Family connections to U.S. First Ladies include Grace Coolidge and Lucretia Garfield. 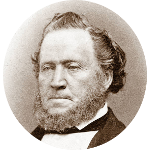 Brigham Young has a number of celebrities in his family tree. These include singer Britney Spears, TV personality Kim Kardashian, and actors Mark Wahlberg, Raquel Welch, Henry Fonda, Jane Fonda, Ted Danson, Matt Damon, Lucille Ball, Anthony Perkins, Halle Berry, and Humphrey Bogart. Historical figures with kinship to Brigham Young include the American Red Cross founder Clara Barton, inventor Eli Whitney, suffragist Susan B. Anthony, rocket scientist Robert Goddard, John Chapman (aka Johnny Appleseed), and signer of the Declaration of Independence William Whipple. His literary kin include authors John Steinbeck, Tennessee Williams, Louis Auchincloss, Thomas Pynchon, and Edgar Rice Burroughs.